« The Bulb Syringe- Not Just For Baby’s Nose! I love to find things that can be combined with another thing or tool to make an interesting station activity for My Obstacle Courses. When they are delivered to my mailbox and are free, I am beyond excited! Grocery advertisements are a perfect example of this. I used them all of the time when teaching Kindergarten to help with reading, math and fine motor skills and have used them with Andrew at home while doing My Obstacle Course. They are always changing so it keeps things interesting! 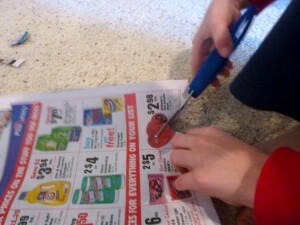 For a February themed My Obstacle Course that we did last week, I combined the grocery advertisements with our loop scissors for Andrew to cut out 5 things he loved. 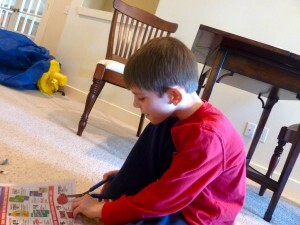 Check out how engaged he is! 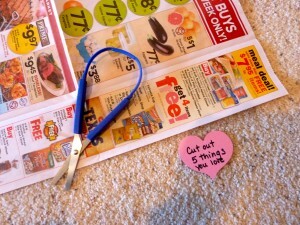 Cutting out a heart. Two previous choices are in the left hand corner. 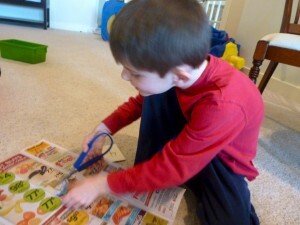 Turning his hand to cut and using the other hand to hold the paper. Progress! 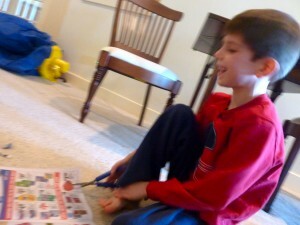 He's totally cracking himself up with his choice! 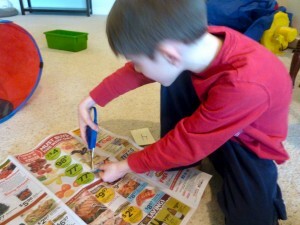 See, practicing cutting skills with grocery advertisements can be fun! !